This hotel is now called the Golden Tulip Brussels Airport Hotel ! 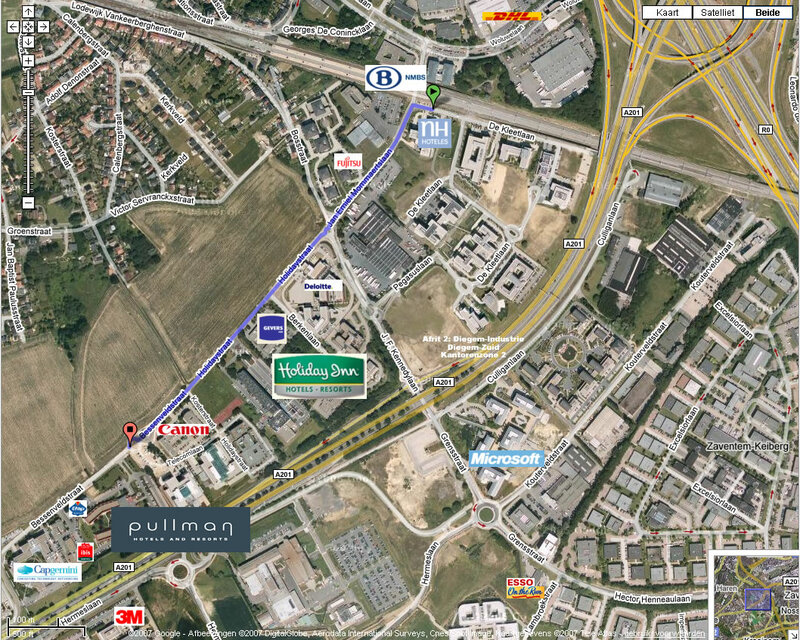 The parking of the Pullman Brussels Airport hotel is no longer free, but the costs associated will be covered by I.T. Works. On entering the parking lot, you take a parking ticket at the dispenser. In exchange for your entry ticket, we'll give you a valid exit ticket when you come and register with us for the seminar. Take bus 272 from the railway/metro station Brussels Noord/Nord to Haacht, ask for "stop Diegem Pullman" (or "Sofitel", as the hotel was known formerly). The bus leaves at 7 minutes past the hour (09h07, ... 13h07, ...) and bus ride till Pullman Diegem takes about 30 minutes in normal traffic). We recommend the Pullman Airport Shuttle bus from our National Airport (level 0 (arrivals, follow airport shuttles to the right), 12h30, 13h00, 13h30, bus ride takes about 15 minutes). Busses stop in front of the hotel. The shuttle busses operate between the airport and the hotel (and back) between 6h15 and 22h00, so you can use this option to get at our morning, afternoon and evening seminars (and back). Brussels Noord-Diegem leaves at 08h59, 09h27, ... 12h57, 13h27, ... and it takes 12 minutes to Diegem. Leuven - Diegem leaves at 08h55, 09h23, ... 12h55, 13h23, ... and it takes 26 minutes to Diegem. If you are looking for accommodation, please contact the Hotel Pullman directly (phone: 02/713.66.15, fax: Fax: (02) 721.54.60). The general phone and fax number are in the table below. If you mention the I.T. Works event, you get a substantial discount, but it still is approx. 200 EUR pp per night.